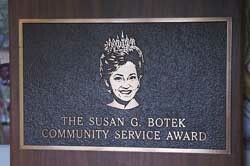 Susan G. Botek, to recognize her commitment to others. the Miss Teen Ohio International Competion as well. The recipient of this award is announced every year and their name is added to a bronze plaque. She also receives a plaque to keep. Miss Teen Ohio supports the "Light the Way" Breast Cancer Foundation. celebration to life, health, family & happiness. We also stress the need to become actively involved in building a better community. Holding true to that commitment, our Competition is a "Not For Profit" venture. Our profits are donated to numerous charities, most importantly Breast Health and Breast Cancer Awareness. well of One Million Dollars for Northwest Ohio. 10 year breast cancer survivor most of the Competition's funds are directed towards Breast Health and Breast Cancer Awareness endeavors.